101 Montelago Blvd | When you stay at The Westin Lake Las Vegas Resort & Spa in Henderson, you'll be on a lake, within a 15-minute drive of Lake Mead National Recreation Area and Sam Boyd Stadium. This 4-star resort is 8.7 mi (14.1 km) from Boulder Strip and 16.4 mi (26.4 km) from University of Nevada-Las Vegas. Make yourself at home in one of the 493 air-conditioned rooms featuring refrigerators and flat-screen televisions. Cable programming and video-game consoles are provided for your entertainment, while wireless Internet access (surcharge) keeps you connected. Private bathrooms with shower/tub combinations feature complimentary toiletries and hair dryers. Conveniences include phones, as well as laptop-compatible safes and desks. When you stay at The Westin Lake Las Vegas Resort & Spa in Henderson, you'll be on a lake, within a 15-minute drive of Lake Mead National Recreation Area and Sam Boyd Stadium. This 4-star resort is 8.7 mi (14.1 km) from Boulder Strip and 16.4 mi (26.4 km) from University of Nevada-Las Vegas. The preferred airport for Loews Lake Las Vegas is Las Vegas, NV (LAS-McCarran Intl.) - 20.6 km / 12.8 mi. Pamper yourself with a visit to the spa, which offers massages, body treatments, and facials. You can get some exercise with a round of golf or enjoy a lazy day at the private beach. Additional features at this resort include complimentary wireless Internet access, concierge services, and gift shops/newsstands. Enjoy Asian cuisine at Marssa Steak and Sushi, one of the resort's 2 restaurants, or stay in and take advantage of the 24-hour room service. Snacks are also available at the 2 coffee shops/cafés. Unwind at the end of the day with a drink at the bar/lounge or the poolside bar. Full breakfasts are available daily from 6:00 AM to 11:00 AM for a fee. Featured amenities include a business center, express check-in, and express check-out. Planning an event in Henderson? This resort has facilities measuring 118778 square feet (11035 square meters), including conference space. Free self parking is available onsite. 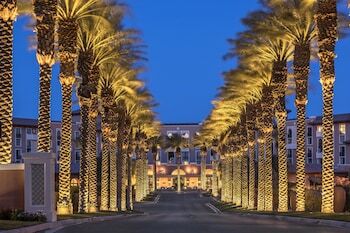 The preferred airport for The Westin Lake Las Vegas Resort & Spa is Las Vegas, NV (LAS-McCarran Intl. ).